For form and function beautifully knit together, nobody does it quite like the architect Charles Rennie Mackintosh. Eighty-seven years after his death, he is already being hailed as the Scottish Michelangelo. Like his illustrious predecessor, he is an artistic polymath: architect, artist and designer all in one. Central to his aesthetic, and to the aesthetic of his wife Margaret Macdonald Mackintosh, was the concept of total design. Working with the artists and makers of their day, the pair designed everything from plumbing to furniture, ceramics to metalwork and upholstery. This exhibition at the Royal Institute of British Architects in Portland Place shows Mackintosh’s ink drawings for his building plans, as well as film footage, videos, watercolours, portraits and architectural models – of private and public (notably the Glasgow Art School) commissions – and that most lyrical of typographies the Charles Rennie Mackintosh font. of Glasgow by kind permission. Viewing the short videos that punctuate the exhibition, you realize that there is no rushing from room to room or up and down stairs in a Mackintosh-designed building except in the most dire emergency. He stops you at every architectural element whether grand staircase or tiny passageway. Nor did he stop at the interiors. Shapely green vistas stretch beyond the windows in nearly everything he did in his native Glasgow, in Ayrshire, and beyond. He was celebrated abroad too. Turin, Moscow, Dresden and Berlin held exhibitions of his work. 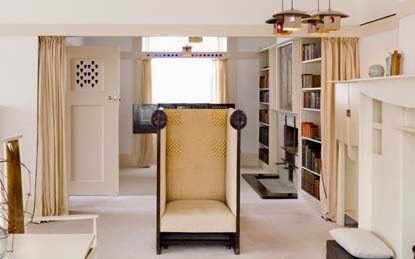 In 1901, the German art publisher Alexander Koch set up a competition for the design of "A House for an Art Lover" which Mackintosh entered with enthusiasm, embracing the German as well as the Scottish aesthetic. Nothing can quite prepare you for the real thing, however, so if you get the chance to visit one his buildings, take it. The Charles Rennie Mackintosh Society publish a helpful list of walking trails and tours that visit the available buildings in and around Glasgow. The Mackintosh Architecture Exhibition was funded by the Arts and Humanities Research Council (AHRC) led by The Hunterian, University of Glasgow.